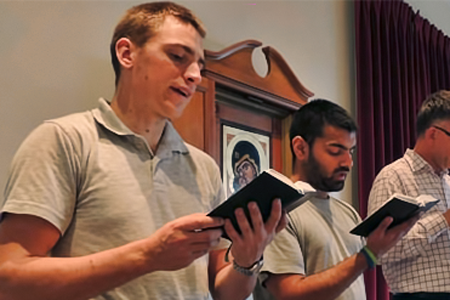 One of the joys of seminary community life is praying together, and singing the Liturgy. Sunday, the Lord’s Day, is shaped around the three Liturgies of the Hours (first vespers, lauds and second vespers). These are sung. Each day of the week, is marked by periods of prayer – particularly daily Mass and the Divine Office in choir. The singing is mostly unaccompanied in the tradition of Gregorian chant. The repertoire is in English, Latin and Maori. We begin each day in quiet personal prayer together. On Tuesdays, Wednesdays and Thursdays there is early morning adoration of the Eucharist. Each month, there is a retreat day, and individual spiritual direction. There are many other opportunities for personal prayer and reading.